Been Thinking About Coming Along? Check Us Out On June 11! If you have been thinking about coming along for a look then June 11 at 7pm is your best bet. Next week (June 4) is the last night for the really serious chess of the club champs. After that we will revert back to something a little less formal with a series of quick fire games. Games will kick off shortly after 7, so dont be late if you want to take part in the mini tournament. New members are always welcome. As an added incentive to sharpen up club members now receive a ranking based on their club rating. In groups of three starting from the highest ranked player each member will be successively designated king, queen, rook, bishop, and knight, with the remaining members designated as pawns. Your club ranking will appear next to your rating here. Check out how you rate, and try and make your way up the hierarchy each week! A rather sedate night tonight with no upsets, fireworks, or sparks. Michael now in an unassailable lead given that Hilton is not going to be present next week. Still some life in the battle for the minor placings so dont miss the final round next week. Ian lost again, but at least this time his game made it in to double figures. Player ratings, summary statistics, and individual member crosstables have all been updated to reflect tonight’s games, and the updated crosstable has been posted under events. One round to go ……. Round six saw Michael overtake Christopher on the top spot of the crosstable following a close game between the two of them on board one. Christopher moves down to number three sharing 4 points with Daniel, with Hilton in second on 4.5 and Michael on 5. With two rounds to go there is still real competition in the Gold-Silver-Bronze. Two draws also this evening with Gary and Richard splitting the point, as did Sivoram and Craig. Game of the night was Daniel-Stefan, which came down to queen and pawn to queen. Once Stefan ran out of checks Daniel took the honours and gained significant ratings points in the process. Ian managed the wooden spoon of the tournament (year?) award losing in spectacular style to Hilton in nine moves. Next week his goal is that the game might make it in to double figures. Player ratings, summary statistics, and individual member crosstables have all been updated to reflect tonight’s games, and the updated crosstable has been posted under events. Two rounds to go ……. Michael has kindly provided some analysis of his game with Hilton last night. The permanent link can be found in the library under the menu above. Text can be copied to a pgn file for replay. (Further contributions to the library always welcome). Michael won in 46 moves but given that both players were under time pressure things may have turned out differently if Hilton had spotted the way to win Michaels queen on move 42. In the diagrammed position Michael has just played Rc1 in response to Hilton’s Rf1 check. 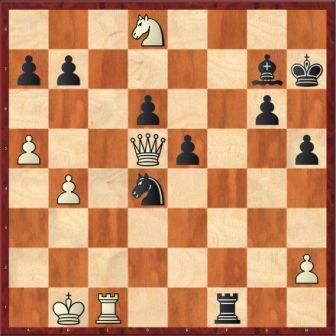 Hilton responded Rf2, but could have won the queen with an alternative move. Can you spot the better continuation, without asking your German friend? 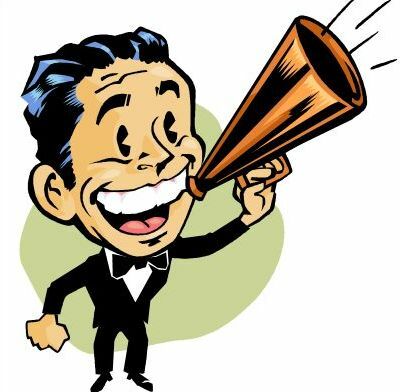 North Island Rapid Registration is OPEN!! 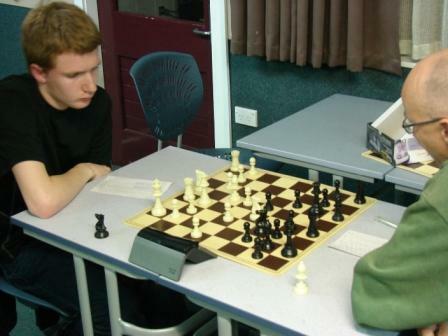 The 2013 North Island Rapid Chess Championship, a Myer Tan Nz Grand Prix Class 2 Event, will be held at St. Paul’s Collegiate School, Hukanui Road, Hamilton Sunday 23rd June, 2013. The format is a FIDE and NZCF rapid rated 6 round Swiss tournament, with each player having 25 minutes plus 5 seconds added from move one. Minimum total prize fund will be $700 (1st: $200, 2nd:$150, 3rd:$100; plus grade prizes – cash & chess books – to the value of $250. Players meeting: 9am sharp, entries close. Round 1 9:30 am – 10:30 am; Round 2 11:00 am – 12 noon; Round 3 12:45 pm – 1:45 pm; Round 4 2:00 pm – 3:00 pm; Round 5 3:15 pm – 4:15 pm; Round 6 4:30 pm – 5:30 pm. Prize-giving will follow as soon as possible after the completion of the last round. All players must be NZCF registered.